This is my first entry for Mellow Yellow Monday meme and this is My Yellow Monday number one. Though I don't like yellow that much but there's something in it that I like of which it resulted of me to join. Thanks to my blogger friends that made me enter this Monday meme. 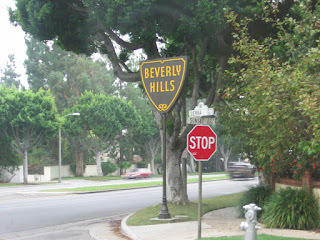 The yellow image above is one of the signage when you're in the Beverly Hills community. That "Beverly Hills" yellow picture was taken during our tour in Beverly Hills, around Hollywood, then going to Hollywood houses of the actors and actresses and the Hollywood attractions . Actually, we're inside the bus that time and took that by myself proof that we were in the Beverly Hills. (~_~) Anyway, that is it - my Yellow Mellow entry. I hope you guys find it cute and interesting. Have a happy Monday! How cool! ... one place I would love to see someday. Hope you can stop by and see mine, I need just "one more" comment. Welcome to MYM, glad you've joined! agoy ka nice sa inyong tour madam sis...yahay kay you leave close to HW!